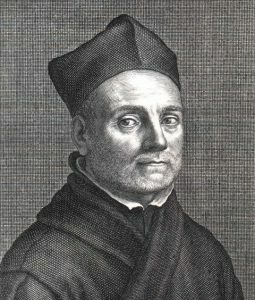 With his enormous range of scholarly pursuits the 17th-century polymath Athanasius Kircher has been hailed as the last Renaissance man and “the master of hundred arts”. 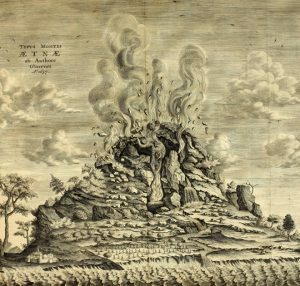 John Glassie looks at one of Kircher’s great masterworks Mundus Subterraneus and how it was inspired by a subterranean adventure Kircher himself made into the bowl of Vesuvius. 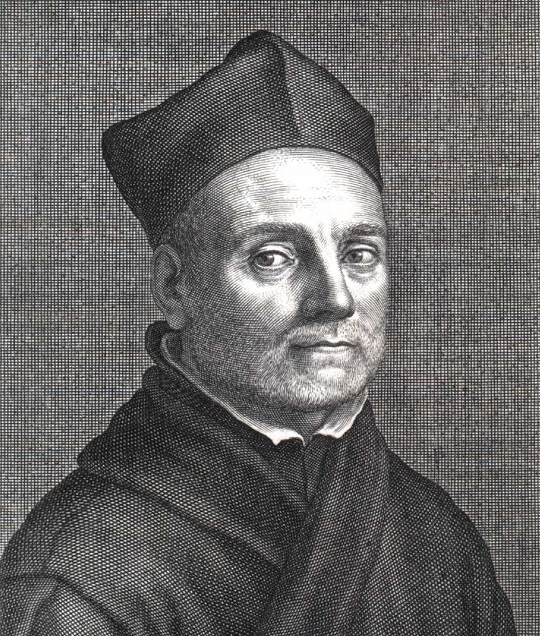 Just before Robert Hooke’s rightly famous microscopic observations of everything from the “Edges of Rasors” to “Vine mites” appeared in Micrographia in 1665, the insatiably curious and incredibly prolific Jesuit scholar Athanasius Kircher published what is in many ways a more spectacular work. 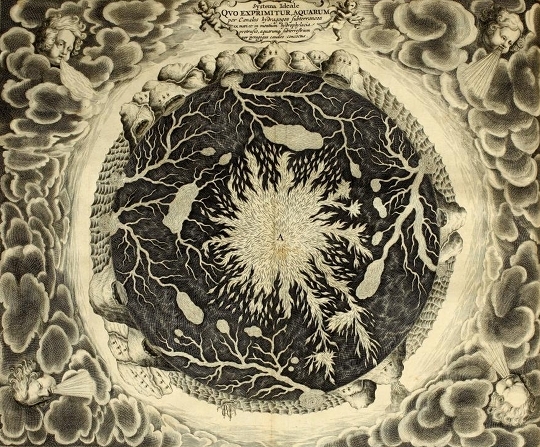 Mundus Subterraneus (Underground World), a two-volume tome of atlas-like dimensions, was intended to lay out “before the eyes of the curious reader all that is rare, exotic, and portentous contained in the fecund womb of Nature.” There is an “idea of the earthly sphere that exists in the divine mind,” Kircher proclaimed, and in this book, one of more than thirty on almost as many subjects that he published during his lifetime, he tried to prove that he had grasped it. 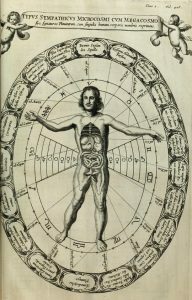 In short, Mundus Subterraneus covered almost every subject that might relate to the realm of earth, as well as many that wouldn’t seem to, such as the sun and “its special properties, by which it flows into the earthly world” and the “nature of the lunar body and its effects.” These correspondences and influences were nothing new, though perhaps only the always-inclusive Athanasius Kircher would choose to publish a series of moon maps in a book about the world below. 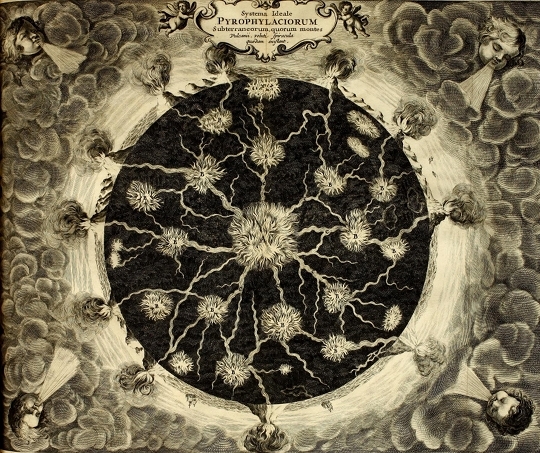 According to Kircher, “the fire and water sweetly conspire together in mutual service.” The tides, caused by the nitrous effluvia of the moon, push “an immense bulk of water” through “hidden and occult passages at the bottom of the Ocean” and thrust it “forcibly into the intimate bowels of the Earth.” The resulting winds “excite and stir up” and otherwise feed the subterraneous fire like a huge bellows. The seas, which would stagnate and freeze without the fires, keep the fires from getting out of hand, preventing “unlimited eruptions,” which would “soon turn all to ruins.” The “secret make-up of the mountains” is that they are hollow and serve as reservoirs. Hot baths, hot springs, and fountains are produced where underground water passageways come near or interconnect with the fire channels. Kircher was about thirty five years old, and had been based at the flagship Jesuit college in Rome for about three of four years — attempting to decipher the hieroglyphics of the ancient Egyptians — when in 1637 he was assigned to accompany a young German prince on an extended visit to Malta. 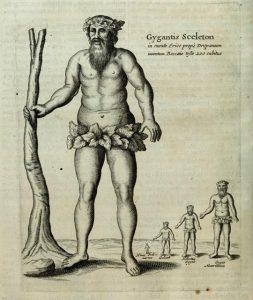 If he was initially upset about being dragged away with an immature prince to some rocks in the middle of the Mediterranean, his curiosity quickly kicked in. 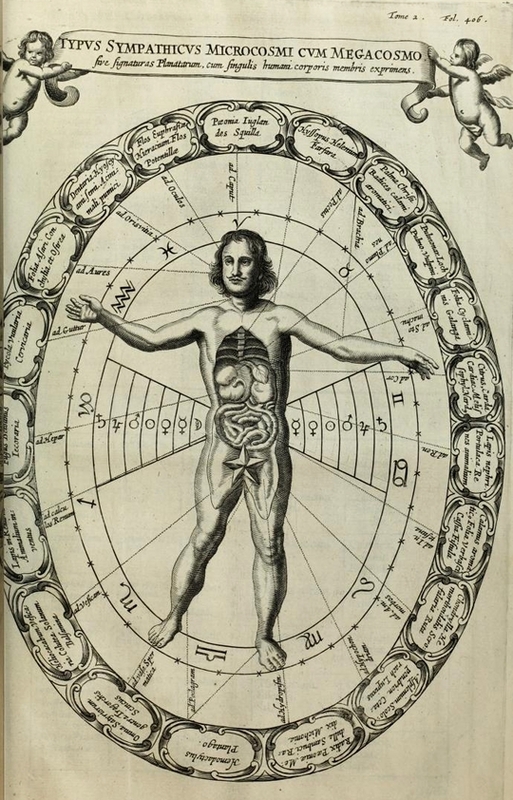 He made magnetic and astronomical readings, and studied geological formations. 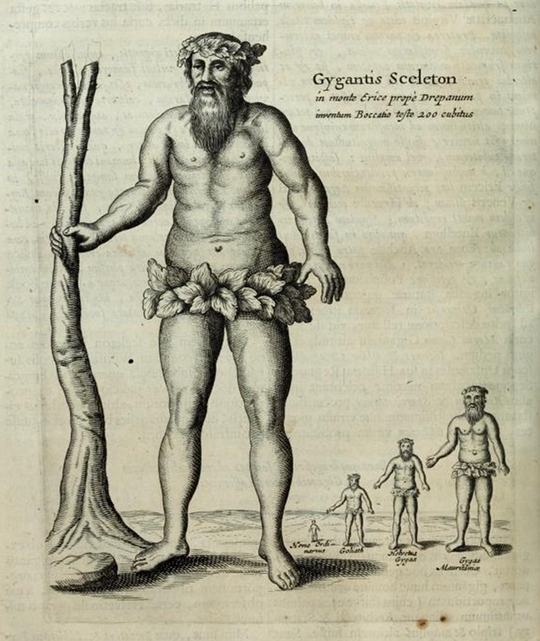 There were four-hundred-foot cliffs, natural arches, and a place where the tides had carved human-looking shapes into the earth. 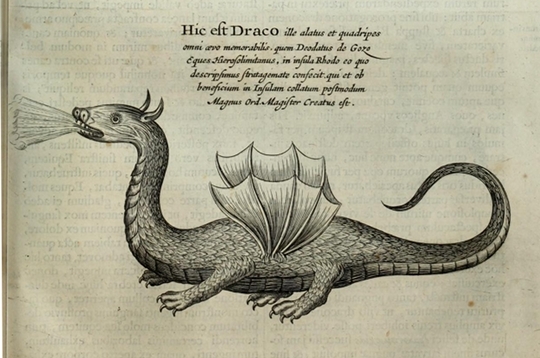 He explored Malta’s megalithic temples, catacombs, and grottoes, and was especially fascinated by its inland seas and underground passageways: how far down did they go? 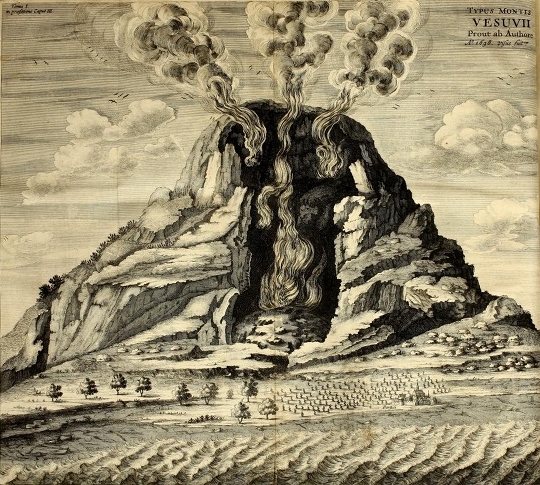 He was especially intent on exploring Sicily’s outcroppings, cliffs, and volcanoes. 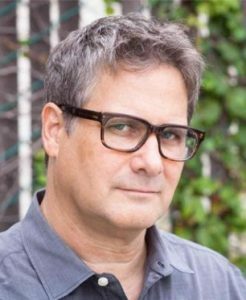 And he wanted to look into stories about a type of fish that lived in the Straits of Messina, the body of water that flows between Sicily and Calabria on the Italian mainland. 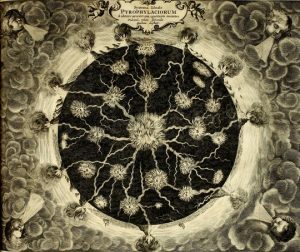 The fish was supposed to be susceptible to a certain kind of song “by which,” Kircher wrote, “mariners are wont to allure it to follow their vessels.” But those plans had to be put aside because of the earthquakes that devastated much of Calabria in the spring of 1638. 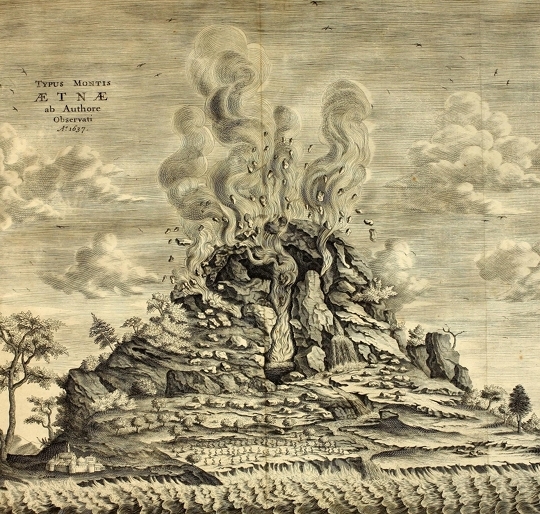 It was within this hollow mountain that Kircher really began to develop the theories he set down so many years later in Mundus Subterraneus, to envision what it might be like even deeper within the earth, and how the mountains and fires and rivers and oceans might somehow all be connected. Calculating the significance of that moment in the history of science is a lot harder than mentioning what appear to be two direct influences on culture: The creation of Bernini’s Fountain of the Four Rivers in Rome was certainly informed by Kircher’s ideas about the interior structure of the earth as well as his ideas about the mystical nature of the universe (that’s another story). 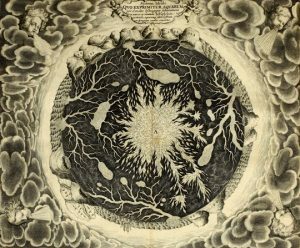 And the spirited, bumbling polymath-dreamer of Jules Verne’s A Journey to the Center of the Earth, who leads a subterranean descent through an old volcanic crater, certainly seems to be based on Kircher himself.